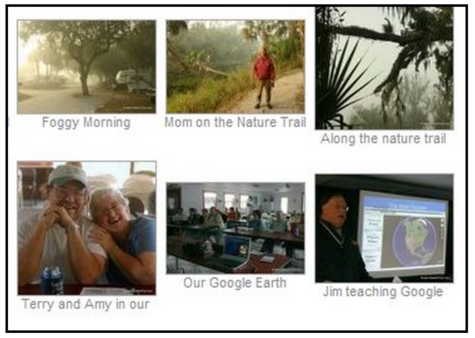 Videos – Learn Picasa and Google Photos! Have you ever taken a video that captured a great moment that you wanted in a still photo? 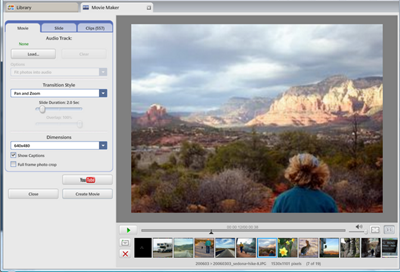 Picasa makes it very easy to capture one shot from a video. Here is a small video clip I took at Palm Creek RV Resort when Jane Seymour made an appearance. She had just finished ‘Dancing with the Stars’ and one of the residents of the resort, Rex, actually danced with her. I was taking video the whole time. What if we wanted a still shot? 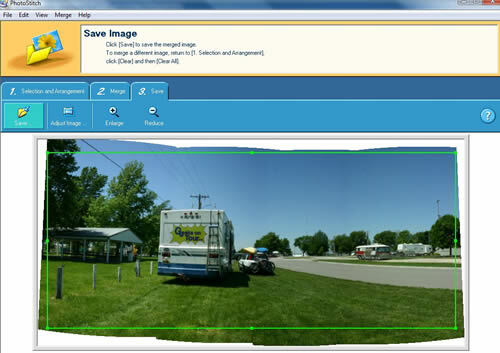 This is a good example for using Picasa’s ‘Take Snapshot’ feature. Play the video until it gets near the spot with the still photo you want. You can also drag the playhead to get in position. Then, to move frame by frame, you can use the < (comma) key to move one frame earlier and the > (period) key to move one frame later. When you have the image you want, just click the ‘Take Snapshot’ button. What this does is creates an individual .jpg picture of that particular frame from the video. Where is it? It’s in the Projects collection. Any time that Picasa creates something, like a collage, or a movie, or a capture from a video, it puts it into this collection. If you don’t see a ‘Projects’ collection, it may be because you are in Tree View. You need to be in Flat folder view to see this collection. 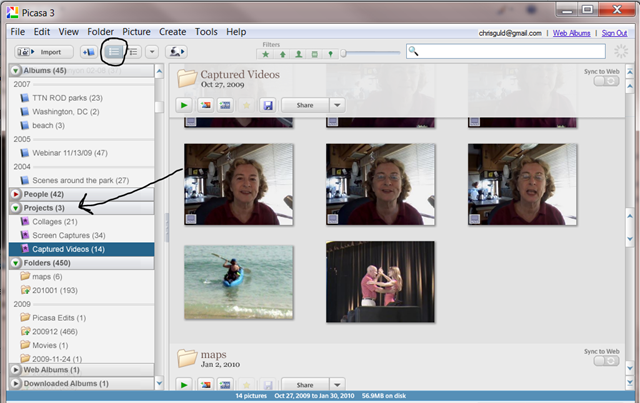 In Tree View, you would look for a Picasa folder underneath your My Pictures folder. The Captured Videos will be there. Now, your captured frame from the video is a .jpg picture just like any other. You can crop it, use I’m Feeling Lucky, add text, and whatever other editing you desire. One caveat: don’t expect high quality. A frame from a video will not be high resolution. This week’s tip is way cool! And, it’s so easy. 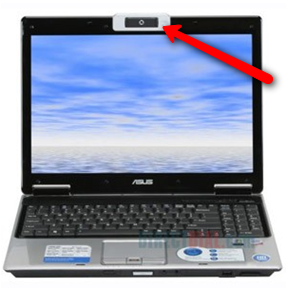 We have so much capability in our laptop computers these days – like that little video camera built right in to the lid. You should see it staring at you when you’re using your computer. But … how do you use it? 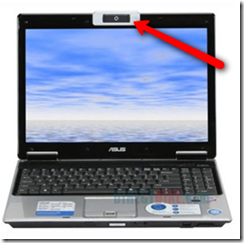 Picasa makes it OH-SO-EASY, just click one button and you can start talking into the camera. Click another button to stop it, then a third to upload it to youtube. Watch the free 2 minute video below to see exactly how its done. Need to learn the basics? Check out our ‘Beginner’s Guide to Picasa’ complete with show-me videos. Our motorhome is currently parked in Salem, Massachusetts. A little city park called Winter Island. We’re using this home base to sightsee in the area, including Boston. For our day in Boston, we decided to take the ferry. Nothing better than a boat ride to start the day, and what a great way to see Boston for the first time! See our blog post on this wonderful day. The weather was setting record highs … 95 degrees, and there was a lot of haze or smog in the air. You couldn’t even see the skyline of Boston until we were almost right on it! Not a good day for taking pictures. I was glad I had my SLR camera with a Polarizing filter, that helps cut thru the haze a bit. Jim has a little Nikon point and shoot (no filters) – I figured my pictures would be much better than his! *I’m Feeling Lucky does almost as good, with one click, as increasing shadows and highlights. The ‘before’ picture I wouldn’t want to show anyone. The ‘after’ picture proudly went on our blog! Members may want to view the following tutorial video. Not a member? Join now. Picasa 3 has a very easy way to take a bunch of photos, add a song you like, and create a movie. All you do is select the photos you want in the movie and click the Movie button at the bottom of the screen. Once in the ‘Movie Maker’ you can add a song from your computer’s music library. It will even time the playback of the photos to match the length of the song. You can also choose among several choices for the transition between photos. Pan and Zoom is the default transition. This is different from Picasa’s slideshow feature in that the end result is a single file – a .wmv movie file. Once the movie is created, you can upload it to your Picasa Web Album, or better yet, to Youtube. It’s a single click to create movie and upload to Youtube. You must already have a Youtube account. The .wmv file will playback on any computer with Windows Media Player. If you want to play it on a TV’s DVD player, you need one more step. In Vista there is a DVDMaker that comes with Windows. Just open that up and add your .wmv file to it – then burn DVD. If you’re on XP, you need some other software like MyDVD from Roxio. For Macintosh, I believe iDVD will do the trick. The movie maker capability in Picasa is very basic. For example, if you would like one song for the first 10 slides and another song for the remaining slides – it can’t do it – one song per movie … period. Our favorite *free* program for making fancier slide show movies is Photo Story 3. (Tutorial video: download and install Photo Story 3). It allows for many different songs on the sound track. It will even create the music for you and make it end at the right place. You can also add narration. A panorama is when you have several individual photos taken in succession of a scene – usually a landscape – and you create one picture by connecting and overlapping the individual photos. So, for example, I took the 4 pictures below with the intent of putting them together into one panorama. Notice that the seams between the original photos are pretty obvious. And, there’s not much you can do about this. If you want to do a lot of panoramas, this is an area where it may be worthwhile to use another software. I have a Canon camera and it came with software called ‘PhotoStitch.’ After simply selecting the pictures and setting their order, below is what I get with Photostitch. It’s really quite amazing how it perfectly aligns the photos and blends the intersection lines. You can save this panorama in your My Pictures folder and Picasa will then treat it like any other picture. If you have a Canon camera, you probably already have Photostitch – it works with both Windows and Macintosh. If not, and you’re on the Windows platform, you can download Windows Live Photo Gallery – this is a download, not the Gallery that comes with Vista. It makes panoramas as easy as 1-2-3. 1)select the photos, 2) click Make – Create Panoramic Photo and 3:Save. The saved photo is now in My Pictures and can be managed by Picasa right along with all your other photos. 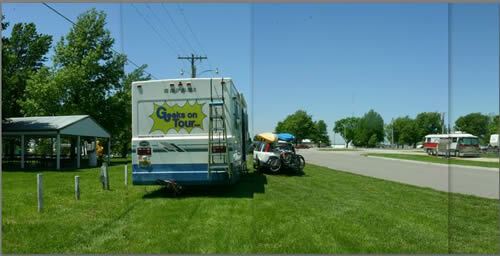 The problem with Live Photo Gallery is that it is a full featured photo management tool like Picasa and it may get confusing having both of them on your computer. One other free download is Hugin. Available for Windows, Mac, and Linux. There is a good article all about it with additional tips on making panoramas at Lifehacker. I am usually not a proponent of Picasa adding features. One of its strengths is that it doesn’t do it all – so what it does do is nice and fast. I like software that is lean and mean. But, when it comes to Panoramas, I’m hoping that this could be added to Picasa without losing any performance. We’ll see, Google adds new features all the time. This is so odd. For all of my 25 years teaching computer software, I’ve repeated over and over again to “Save your work!” “Save often.” With most software that is important. But, with Picasa I never use the Save command! You really don’t have to. Picasa remembers everything you’ve done to a picture. As long as you use Picasa, what you see is what you get. But, if you use another program to view that picture on disk it will see the original photo without Picasa’s edits. To use a photo in another program, you must either Save, or Export. I use the Export command to create a new original. Export is the only way I can make the photo a different size as well. If you want to use the Save command, let me tell you how it works. I’ll use the example of a photo I took of a hay field. I think it would be more artistically pleasing as a black and white, so I use the B&W effect in Picasa, and I see it in Picasa as a B&W photo. But, the original, color photo is still what’s on the disk in My Pictures. If I use Powerpoint, for example, and import the Hayfield photo from disk, I’ll get the color one. You can save your edits to disk by using File | Save, or by right-clicking on the photo and selecting Save. Now the photo file on disk will also be B&W, and therefore, if you use Powerpoint to insert the file, you will get the B&W version. But, what if you should change your mind sometime and want the color one back? No problem, Picasa won’t allow you to lose your original. When you use the Save command, Picasa creates a hidden folder called ‘Originals’ and puts your original, color photo in there. After you save a photo, Picasa’s ‘Undo’ button will show, “Undo Save.” If you click on that, Picasa will retrieve the original from the hidden folder and put it back in the file position. So, go ahead and Save if you want to! It doesn’t hurt anything, you can always ‘Undo’ the save. It just takes up extra space on your disk for the originals. And, it certainly is less confusing when the pictures on disk are the same as what you see in Picasa! Picasa even provides a button to save all the edits in any given folder. Look in the upper right corner of any folder in the Library view. In the example below, Picasa tells me it will save the edits on 88 pictures if I just click the ‘Save to Disk’ button. That would also put 88 originals into the Originals folder. 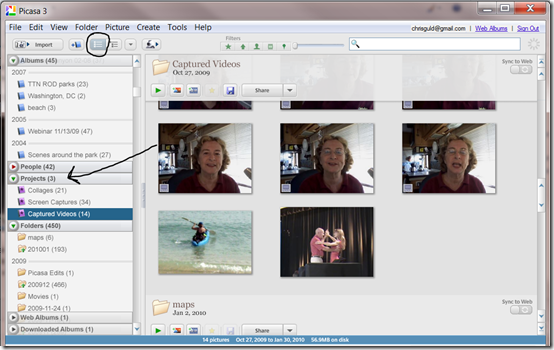 Captions are stored with the picture file itself, so are visible in many other programs. If you click on the image above, it will take you to the actual web album. Then, find that picture of Jim teaching Google Earth and click on it. You will see that captions don’t have to be limited to a few words. I typed a whole paragraph on that one! Do you have a scanner and some old photos you want to scan? Have you started to read the manual and given up on figuring it out? I have good news for you! You don’t have to figure out the software that came with the scanner, because Picasa can handle it all for you, it’s just like importing from your camera but, instead of camera, you import from the scanner. Make sure everything is connected and turned on! Now you will see a screen that depends on your scanner. There should be an option to ‘Preview’. Click that. When it’s done scanning, you’re back at the standard Picasa Import screen. Click Import all. Select a folder to put it in. I made a folder called ‘Old Photos’ for the first one, then, for each subsequent scanned photo, I selected that existing folder from the drop-down list. I scanned 53 old photos in this manner. It took me somewhat over an hour. Then I just took another few seconds to use Batch Edit and do an ‘I’m Feeling Lucky’ and ‘Sharpen’ to all 53 at once. I think the results are great. What do you think? 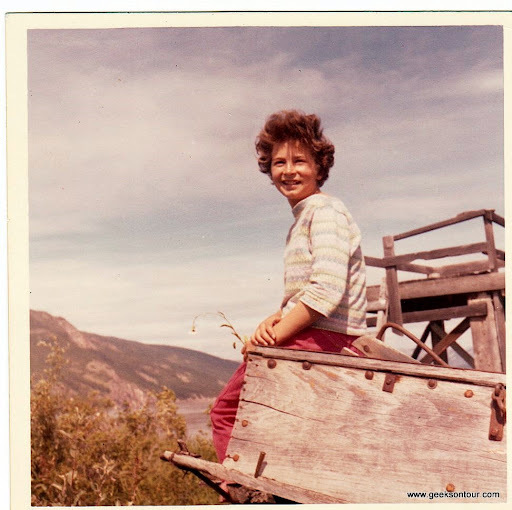 This is a photo from circa 1962 – me at 10 years old in Alaska. It looks better than the original! How about when you return to the Canyon in 2009? Do you put them in with your other Grand Canyon photos, or make a new Summer 2009. If you make a Summer 2009 folder, how can you see a slide show of all your Grand Canyon photos? Whatever you do, DO NOT make copies of the pictures so they can be in a Grand Canyon folder and a Summer 2009 folder. That quickly becomes a mess. You don’t need to organize your pictures into lots of different folders. Just keep it simple, all pictures into one folder for the year – or, if you take enough, put them into folders by month. Picasa has this magical feature called Albums. An album is like a virtual folder. You can go thru all your pictures and find the photos of your dog, marking them for a ‘dog’ album. You haven’t moved the pictures, you haven’t copied them, you’ve just created a list of pointers to them so they are all grouped in one place. That place is called an Album. Select the photos, then click the ‘Add to Album’ button. Once a group of photos has been marked in an album, you can now create a Gift CD with all the photos in the album, you can make a movie, or a slideshow, export them or upload them all at once. So, don’t organize your photos into a lot of separate folders. And, definitely don’t make extra copies of them to put in different folders. Just make one simple folder structure – I put all photos into a folder for the month they were taken. This also makes it a simple matter to back up my photos. I do it every month and I just back up the folder for that month. Then, you can create as many different Albums as you want. One picture of my dog, Odie, in June of 2008 will be stored in the folder 200806. But, it could show up in an Album called ‘Odie’, another album called ‘Minnesota’, and a third called ‘Dogs.’ The picture only exists once on my computer – in the folder. You can view it in that folder, as well as in all three Albums. The albums are magical creations – the photos don’t really exist there. I can delete a photo from an album but it still exists in the folder and whatever other albums I may have grouped it in. However, if I delete the photo from the folder … It’s gone. Albums are wonderful creations, but you also need to understand that they are a creation of Picasa alone. If you ever need to use some other program to see your pictures, the albums won’t be there.